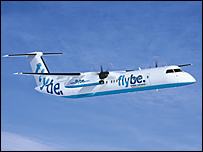 The Flybe Bombardier Q400 plane, a flight from Manchester to Edinburgh, flew for 20 minutes on one of its two turboprop engines, before landing at Edinburgh Airport at 0750, with emergency vehicles on standby. All 36 people on board the Flybe flight evacuated the plane just before 0800 BST. "When the captain told us they were going to cut an engine everyone went quiet, probably because they were apprehensive. We came down with a bang much more than normal and he stopped the plane quickly." Jim Mulhall, 47, a passenger on the Flybe plane. "I did wonder if the engine was on fire when I saw all the fire engines outside the plane." "On Monday morning, Flybe flight BE7220 from Manchester to Edinburgh landed without incident at 0750 after reporting a technical fault with the aircraft. This resulted in a warning light showing on the control panel. Engineers are investigating the fault and the aircraft is expected to resume its normal flying pattern this afternoon. The Bombardier Q400 is a state of the art aircraft that is designed and manufactured to land safely after such an incident. There was no adverse reaction from the passengers on board who disembarked safely upon arrival at Edinburgh."